KIAA1199; Prognostic marker; Non-small cell lung cancer (NSCLC). Lung cancer is one of the most lethal human malignancies in the world. The number of new lung cancers is estimated to be 221,200 and estimated death exceed 60 percent in 2015 based on the data during 1995 through 2011 . Non-Small Cell Lung Cancer (NSCLC) accounts for more than 80% of all lung cancers . In the past few decades, the five-year survival rate after diagnosis of NSCLC is found less than 15% and conventional treatments are not effective enough to improve the prognosis of the disease . The molecular carcinogenesis of NSCLC remains unclear and is widely accepted to be caused by multiple alterations of gene expression, which cause abnormal changes in signaling pathways and biological behaviour. Therefore, there is a need to identify novel molecules for diagnostic and therapy of NSCLC. KIAA1199 is mainly expressed in cochlear tissues and the mutated form of KIAA1199 might be associated with the nonsyndromic hearing loss . Up regulation of KIAA1199 gene expression will inhibit cellular mortality and the repression of the gene may attenuate wnt-signaling pathway in colon cancer cells [5,6]. Besides, the high expression of KIAA1199 plays an important role in tumor progression in Colorectal Cancer (CRC) . Induction of this protein in colon cancer cells will cause a poor prognosis . Several studies have also been performed in gastric cancer and breast cancer and conclusions were similar [9,10]. However, currently, the relationship between KIAA1199 and NSCLC is still unclear. In the present study, we compared KIAA1199 expression between NSCLC tissues and normal lung tissues and analyzed the clinical pathological and prognostic significance of KIAA1199 in NSCLC patients. Our aim was to confirm whether the expression of KIAA1199 can be used to predict the prognosis of NSCLC. A total of 153 cases of tumor specimens were collected from patients who underwent biopsy or surgical resection and were diagnosed as lung adenocarcinoma or squamous cell carcinoma in our hospital from January 2008 to December 2013. Meanwhile, 45 normal lung tissues were taken as normal control. The pathological staging was performed based on the International Staging System . The informed consent was obtained from all patients and the study was approved by the ethics committee of Nanfang Hospital, Southern Medical University. Formalin-fixed, paraffin-embedded 153 NSCLC and 45 normal tissues were used for the IHC studies. Briefly, the tissue was sliced continuously into about 4 μm sections and the slides were de-paraffinized and rehydrated. After blocked with 3% hydrogen peroxide in methanol, non-specific binding was blocked with goat serum. Anti-KIAA1199 antibody (1:20, Atlas) was added and incubated overnight at 4°C. The sections were then incubated with biotin-labelled secondary antibodies for 30 min at room temperature and HRP-labeled streptavidin was added. All slides were analyzed and calculated by two independent pathologists. The statistical method of final IHC score followed previous studies [12,13]. Blood analysis, chest X-ray, ultrasound examination, and computed tomography were undertaken during follow-up periods. Each patient was scheduled for an examination every 3 months for the first 2 y and at 6-month intervals thereafter during the follow-up period (3 y). All statistical analysis was performed by SPSS 19.0 software (SPSS, Inc., Chicago, IL, USA).The chi-squared test was used to examine the association between KIAA1199 protein expression and patients’ clinicopathologic factors. The comparison of survival time was showed by Kaplan–Meier curves, and statistical differences were compared with a logrank test. The prognostic value was determined by multivariate Cox regression analysis. P<0.05 was considered to be statistical significance. In order to understand the clinical features of patients, detailed data of the patients, such as gender, age, differentiation degree, TNM stage, were collected from the medical records, which were summarized in supplementary data 1. Of the 153 patients in this study, 119 (77.78 %) were men and 34 (22.22 %) were women, ranging in age from 20 to 82 y. To identify the expression and location of KIAA1199 protein, IHC analysis was performed. The 153 NSCLC tissues revealed that the staining of KIAA1199 protein was mainly located in the cell cytoplasm. In some cases, KIAA1199 protein was found in the nucleus and cytoplasm. Various intensities could be observed in different tissues and representative images were shown in Figures 1 and 2. 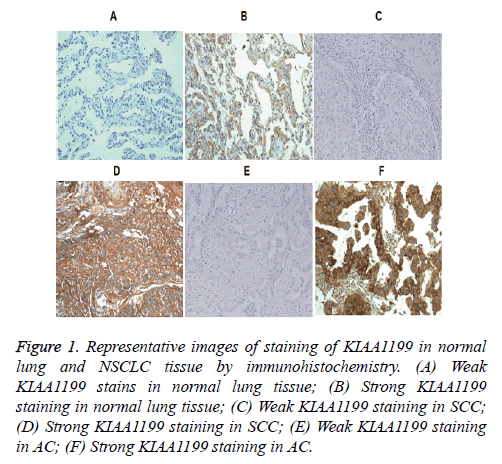 Figure 1: Representative images of staining of KIAA1199 in normal lung and NSCLC tissue by immunohistochemistry. (A) Weak KIAA1199 stains in normal lung tissue; (B) Strong KIAA1199 staining in normal lung tissue; (C) Weak KIAA1199 staining in SCC; (D) Strong KIAA1199 staining in SCC; (E) Weak KIAA1199 staining in AC; (F) Strong KIAA1199 staining in AC. Figure 2: Representative images of nuclear staining of KIAA1199 in NSCLC tissue by immunohistochemistry. (A) The immunohistochemistry staining of KIAA1199 in SCCe of NSCLC; (B) The immunohistochemistry staining of KIAA1199 in AC of NSCLC. In this study, 76 of 153 NSCLC tissues (49.67%) showed KIAA1199 protein was overexpression, and the other 77 cases (50.23%) showed weak positive or negative of KIAA1199 protein expression. However, in normal lung tissues, 11 out of 45 normal tissues (24.44%) showed KIAA1199 protein overexpression and other 34 cases (75.56%) showed weak positive or negative of KIAA1199 protein expression. Statistical analysis showed that KIAA1199 protein expression was up-regulated in NSCLS tissues compared to normal tissues (Table 1; p=0.003). This result showed KIAA1199 protein expression might be linked to NSCLS. Table 1: Comparison of KIAA1199 Expression in normal lung and non-small cell lung cancer tissues. 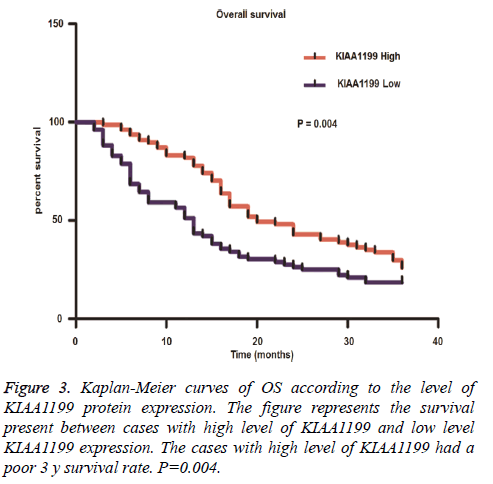 In order to investigate whether KIAA1199 protein was associated with NSCLC progression, we analyzed the correlation between KIAA1199 protein expression and clinicopathologic parameters in 153 patients with NSCLC. As shown in Table 2, it was found that high KIAA1199 protein expression was significantly associated with poor differentiation (P=0.003), higher TNM stage (P=0.016), and positive lymph node metastasis (P=0.001), but not with gender and age (P>0.05). Besides, high KIAA1199 protein expression was more common in Adenocarcinoma (AC) than Squamous Cell Carcinoma (SCC) (P=0.001). The result suggested that KIAA1199 protein expression was associated with clinicopathologic parameters such as poor differentiation, higher TNM stage, and positive lymph node metastasis. Note: P value, Chi-squared test; AC: Adeno-Carcinoma; SCC: Squamous-Cell Carcinoma. Table 2: Correlation between clinicopathological parameters and KIAA1199 protein expression. To investigate the effect of KIAA1199 protein on NSCLC prognosis, survival analysis on these 153 patients was performed. Firstly, the association between clinicopathologic factors and patients’ outcomes was analyzed. The related data were presented in Table 3 and it was shown that poor histopathologic differentiation, positive lymph node metastasis and high TNM stage were associated with a significantly worse Overall Survival (OS). Then, we analyzed the prognostic significance of KIAA1199 protein. Kaplan-Meier analysis of OS showed patients with KIAA1199 protein overexpression (P=0.004) had a poor 3 y survival rate (Figure 3). Figure 3: Kaplan-Meier curves of OS according to the level of KIAA1199 protein expression. The figure represents the survival present between cases with high level of KIAA1199 and low level KIAA1199 expression. The cases with high level of KIAA1199 had a poor 3 y survival rate. P=0.004. Note: OS: Overall Survival; CI: Confidence Interval; AC: Adeno-Carcinoma; SCC: Squamous-Cell Carcinoma. Table 3: Univariate Kaplan-Meier survival analysis of OS in 153 patients with non-small cell lung cancer. A multivariate Cox regression model was used to analyze the independent factors of NSCLC prognosis. It was shown KIAA1199 protein expression (P=0.040) and TNM stage (P=0.012) were independent prognostic factors of patients’ OS (Table 4). This result indicated that KIAA1199 protein expression might be used as an independent prognostic marker in NSCLC. Note: OS: Overall Survival; RR: Relative Risk; CI: Confidence Interval. Table 4: Multivariate Cox regression model of OS in 153 patients with non-small cell lung cancer. NSCLC is characterized by the presence of a highly malignant tumor and a poor prognosis and short term survival. Numerous studies and clinical trials have tried to elucidate the factors that influence tumor progression, but few advances have been made in the past 15 y. Genetic abnormalities have been taken into account in the recurrence and early metastasis of NSCLC . Therefore, it is important to explore new prognostic markers to predict patients for unfavourable prognosis. KIAA1199 is a glycosylated protein, located in the cytoplasm and membrane, especially the endoplasmic reticulum [5,15,16]. Many studies have focused on the relationship between cancer and KIAA1199. In breast tumor, KIAA1199 can regulate cell growth and invasion and could be a novel therapeutic target . The similar analysis reported that KIAA1199 overexpression predicts poor survival in patients with colon cancer . KIAA1199 protein can promote tumor progression by several mechanisms. Other studies have shown that the KIAA1199 protein expression level was elevated upon p53 activation . The expression of KIAA1199 was also induced in hypoxia and was regulated by Jarid1A, resulting in cell migration . Furthermore, the activation of NF-κB pathway could induce KIAA1199, and then transmit pro-survival and invasive signals . KIAA1199 was also associated with angiogenesis in rheumatoid arthritis . However, little is known about the mechanism of KIAA1199 tumor-promoting effects in NSCLC. In this study, we detected the expression of KIAA1199 protein and then analyzed the prognostic value of KIAA1199 protein in patients with NSCLC. Our results demonstrated that significant associations of KIAA1199 protein with prognosisrelated features, including histo-pathologic differentiation, TNM stage and lymph node metastasis. It was likely that KIAA1199 protein played an important role in NSCLC progression. Further statistical analysis revealed the OS time of patients with high KIAA1199 protein expression was worse than those with low KIAA1199 protein expression, indicating that KIAA1199 protein overexpression was significantly related with poor 3-y survival rate. Histopathologic differentiation, TNM stage and lymph node metastasis were also involved in patient survival. Multivariate survival analysis manifested that KIAA1199 and TNM stage were significant independent prognostic factors for OS of NSCLC patients. Based on these observations, we hypothesized that KIAA1199 could regulate NSCLC progression. We also found 4 cases of KIAA1199 were detected in the nucleus. Translocation of protein may be involved in transcription regulation, such as beta-catanin. However, the number of samples was so small that statistical analysis could not be performed. In the future, we need to investigate whether this translocation of protein can predict a poor prognosis with more patients’ data. In conclusion, our results revealed significant associations of KIAA1199 protein expression with various clinicopathologic characteristics and prognostic of NSCLC patients. Moreover, survival analysis showed that KIAA1199 was an independent prognostic factor for overall survival in NSCLC. All of these findings indicated that KIAA1199 protein might be used as a pathological marker to identify individuals with poor outcomes and to provide a reference for clinical therapy in the future. This study was funded by Medical and Health Research Projects of Yichang (A14301-30). Siegel RL, Miller KD, Jemal A. Cancer statistics. CA Cancer J Clin 2015; 65: 5-29. Cheng TD, Cramb SM, Baade PD, Youlden DR, Nwogu C, Reid ME. The international epidemiology of lung cancer: Latest trends, disparities, and tumor characteristics. J Thorac Oncol 2016. Youlden DR, Cramb SM, Baade PD. The international epidemiology of lung cancer: Geographical distribution and secular trends. J Thorac Oncol 2008; 3: 819-831. Abe S, Usami S, Nakamura Y. Mutations in the gene encoding KIAA1199 protein, an inner-ear protein expressed in deiters' cells and the fibrocytes, as the cause of nonsyndromic hearing loss. J Hum Genet 2003; 48: 564-570. Michishita E, Garces G, Barrett JC, Horikawa I. Upregulation of the kiaa1199 gene is associated with cellular mortality. Cancer Lett 2006; 239: 71-77. Birkenkamp-Demtroder K, Maghnouj A, Mansilla F, Thorsen K, Andersen CL, Oster B, Hahn S, Orntoft TF. Repression of KIAA1199 attenuates wnt-signalling and decreases the proliferation of colon cancer cells. Br J Cancer 2011; 105: 552-561. Xu J, Liu Y, Wang X, Huang J, Zhu H, Hu Z, Wang D. Association between KIAA1199 overexpression and tumor invasion, TNM stage, and poor prognosis in colorectal cancer. Int J Clin Exp Pathol 2015; 8: 2909-2918. Fink SP, Myeroff LL, Kariv R, Platzer P, Xin B, Mikkola D, Lawrence E, Morris N, Nosrati A, Willson JK, Willis J, Veigl M, Barnholtz-Sloan JS, Wang Z, Markowitz SD. Induction of KIAA1199/CEMIP is associated with colon cancer phenotype and poor patient survival. Oncotarget 2015; 6: 30500-30515. Jami MS, Hou J, Liu M, Varney ML, Hassan H, Dong J, Geng L, Wang J, Yu F, Huang X, Peng H, Fu K, Li Y, Singh RK, Ding SJ. Functional proteomic analysis reveals the involvement of kiaa1199 in breast cancer growth, motility and invasiveness. BMC Cancer 2014; 14: 194. Matsuzaki S, Tanaka F, Mimori K, Tahara K, Inoue H, Mori M. Clinicopathologic significance of kiaa1199 overexpression in human gastric cancer. Ann Surg Oncol 2009; 16: 2042-2051. Wittekind C. 2010 TNM system: On the 7th edition of tnm classification of malignant tumors. Pathologe 2010; 31: 331-332. Remmele W, Stegner HE. Recommendation for uniform definition of an immunoreactive score (IRS) for immu­nohistochemical estrogen receptor detection (ER-ICA) in breast cancer tissue. Pathologe 1987; 8: 138-140. Gou HF, Chen XC, Zhu J, Jiang M, Yang Y, Cao D, Hou M. Expressions of COX-2 and VEGF-C in gastric can­cer: correlations with lymphangiogenesis and prognostic implications. J Exp Clin Cancer Res 2011; 30: 14. Coate LE, John T, Tsao MS, Shepherd FA. Molecular predictive and prognostic markers in non-small-cell lung cancer. Lancet Oncol 2009; 10: 1001-1010. Tiwari A, Schneider M, Fiorino A, Haider R, Okoniewski MJ, Roschitzki B, Uzozie A, Menigatti M, Jiricny J, Marra G. Early insights into the function of kiaa1199, a markedly overexpressed protein in human colorectal tumors. PLoS One 2013; 8: e69473. Evensen NA, Kuscu C, Nguyen HL, Zarrabi K, Dufour A, Kadam P, Hu YJ, Pulkoski-Gross A, Bahou WF, Zucker S, Cao J. Unraveling the role of kiaa1199, a novel endoplasmic reticulum protein, in cancer cell migration. J Natl Cancer Inst 2013; 105: 1402-1416. Shostak K, Zhang X, Hubert P, Goktuna SI, Jiang Z, Klevernic I, Hildebrand J, Roncarati P, Hennuy B, Ladang A, Somja J, Gothot A, Close P, Delvenne P, Chariot A. Nf-kappab-induced KIAA1199 promotes survival through EGFR signalling. Nat Commun 2014; 5: 5232. Yang X, Qiu P, Chen B, Lin Y, Zhou Z, Ge R, Zou H, Wang J. KIAA1199 as a potential diagnostic biomarker of rheumatoid arthritis related to angiogenesis. Arthritis Res Ther 2015; 17: 140.